Ever notice how much easier it is to do well when you’re already doing well? How much easier it is to be courageous when you’re already being courageous? How much easier it is to thrive when you’re already thriving? It’s a momentum thing – keeping things moving is far easier than getting them to move in the first place. Anyone who’s ever tried to push a stalled car (before versus after it’s started rolling) knows what I mean. Momentum applies to things we’d rather stop doing, as well. As in how easy it is to keep eating nachos as long as there are still some left on your plate. As in how much much easier it is to just keep watching TV instead of pushing the remote’s off button and doing something else. As in how much easier it is to tolerate a messy desk than take the few minutes needed to actually clean it up. Step Three – I realized that as much as I liked Step One’s outcome, I did not want Step Two’s outcome. 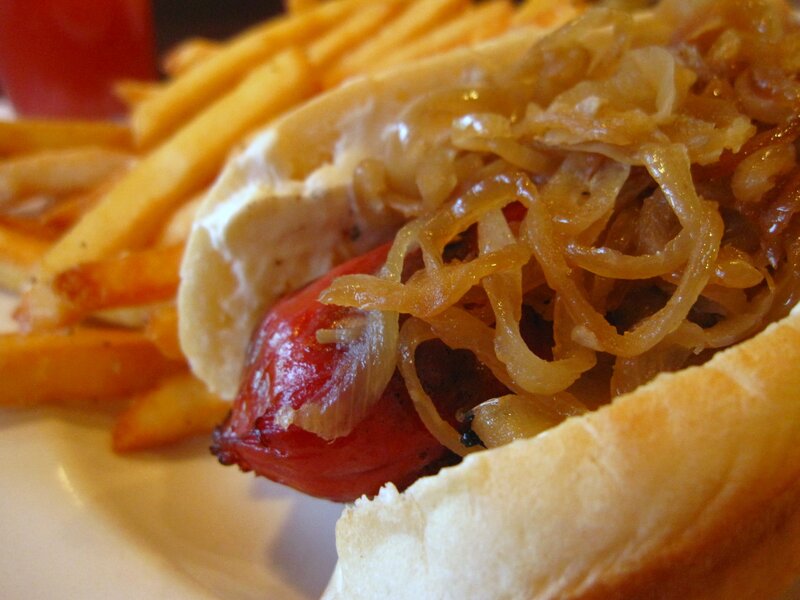 Step Four – I went to a local hot dog joint to see if I could break my ‘dog-and-fries’ momentum. And I DID! I ordered a hot dog with a side salad, instead. YEA, me! Well that’s not entirely true – I actually ordered TWO hot dogs with a side salad…and then promptly ate both dogs, and took the salad home with me for my wife! Not quite as clean of a victory as I was hoping for, but, hey, I didn’t have any fries, which was the point of the exercise, right?! So what happened here? Let me break it down, as it happened, so you can see how quickly willpower can unravel. First, why two dogs? Oh, look, a Special – two dogs and fries; substitute salad for fries, extra $1. Clearly, that’s for me cuz I came here to order a salad! Besides, I can take the second dog home and have it later. Done. But, boy, this first dog sure tastes good. And I don’t really want the salad anymore, so what if…what…if…I take the salad home and enjoy the second dog, here and now?! Yes, that’s a plan – a very good plan. Besides, I didn’t get the fries so I deserve a little treat, don’t I? Done and done. And just that fast, the second dog was gone. Fast-forward to Kelly McGonigal, author of The Willpower Instinct, who made the point in a TED Talk that the problem with us being ‘good’ – by not ordering fries, in my case – is that it quickly turns into us believing that we’ve been ‘good enough’ to deserve a little treat. And that’s exactly what happened to me – the second dog was the ‘treat’ for not having fries. More sleep (an hour more can do wonders to improve one’s cognitive functioning, which ultimately is what’s in charge of our short-term versus long-term decision making processes. Better eating (bz: less lousy eating). Forgive ourselves – Specifically by reminding ourselves that failure is part of the process, that failure facilitates learning far better than success does, and that no one is perfect, anyway, so don’t beat yourself up for being human. Making friends with our Future Self – Check this out: She posits that the weaker our relationship is with our Future Self, the harder it is to maintain willpower because willpower is ultimately a choice between what would benefit our Future Self, versus our Present Self. And if our Future Self is estranged from us (or a stranger to us) the operative question unfolds as: “Why in the world would I do something to protect/help a stranger by depriving my Present Self of something I really, REALLY, want here and now? McGonigal suggests that when we are in regular conversation with our Future Self, it becomes far easier to be ‘altruistic’ towards him/her. Predicting our failure – Imagining failure helps willpower more than imagining success because imagining success makes us feel like we’re that much closer to it, which justifies (and inevitably condones) us backsliding. So, better to write out our predicted excuses for backsliding – become detectives of our future failures – so we can then decide how we WANT to respond to, and thus be better prepared for, those excuses when they ultimately (and inevitably) show themselves. Notice the thought, craving, or feeling. Accept and attend to the inner experience. Breathe and give your brain and body a chance to pause and plan. Broaden your attention, and look for the action that will help you achieve your goal. The proof, of course, is in the pudding…or french fries…or hot dogs. I’ve really got to talk with my future self about all this.